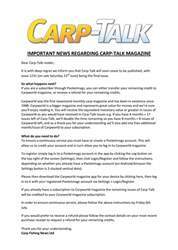 This week’s issue of Carp-Talk (issue 1032) is available to download now. 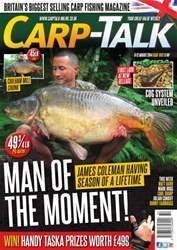 James Coleman tops the catches this week thanks to his second personal best of the year in the shape a 49¾lb Kent park lake mirror, adding to his 57lb 3oz common from Strawberry Fields in May. 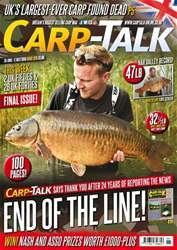 Matt Rand looks back at the World Carp Classic qualifier on the North Lake at Wraysbury 1. 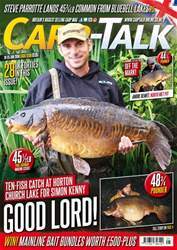 Julian Cundiff gets self-critical about his carping performance, Team Korda introduces the new COG system, and Carl Sharp recalls the tactics he adopted to tempt his biggest UK carp. We take a look at five more venues in ‘Where to Fish’, the new Phat Fish Clothing T-shirts and the Top 100 Day Ticket Carp Waters: East Anglia book are reviewed, and products from Nash, Fox, Cygnet, Gardner, Sticky, Avid and 30Plus go under the spotlight. 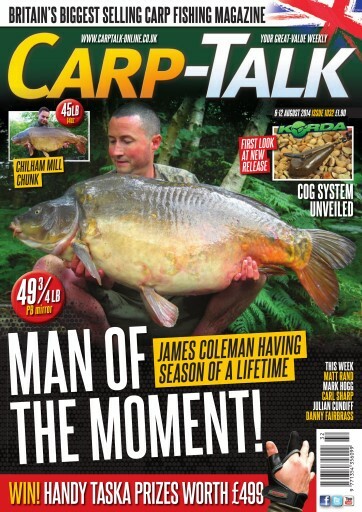 The Fox-Mainline Carp Angler of the Year competition continues and there’s £499 worth of Taska goodies to give away, including 25 casting gloves.